A female detective from Windsor Police Department was named the American Legion’s Law Officer of the Year. Detective Jennifer Frank was chosen from numerous Vermont Law Enforcement Officers nominated for the prestigious award. 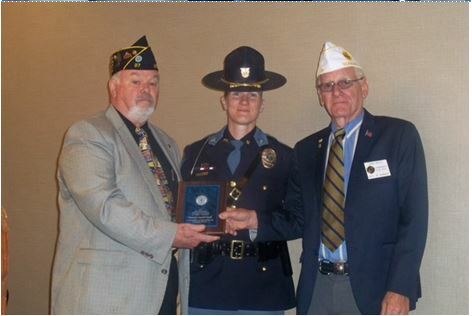 Detective Frank is also the first woman to receive the award that was presented to her on Sunday at the Holiday Inn in Rutland VT. Detective Frank will now be nominated for the American Legion’s National “Law Officer of the Year” by the Vermont Chapter. Congratulations to Detective Jennifer Franks for this achievement. An Acworth NH man is in the hospital after being struck by a car in Saxtons River on Monday afternoon. Vermont State Police said 92-year old Alston Barrett was crossing Main Street when a Chevy Malibu driven 87-year-year old Dante J. Papale of Saxtons River struck him. According to Papale, he was traveling at 10 MPH and did not see Mr. Barrett. Barrett was alert and conscious and was treated by EMS personal and then transported to Springfield Hospital. Barrett was later transferred to D.H. M.C. Anyone with information regarding this accident investigation is asked to call Trooper Colin Shepley at the Westminster Barracks at 802-722-4600. Vermont State Police are investigating a water-related death that occurred Sunday night on Broad Brook Road in Guilford. Police said Guilford Fire and the Brattleboro Dive team responded to the scene to assist with the incident. The 28-year-old male victim’s name is being withheld pending family notification. The victim’s body was sent to the Office of the Chief Medical Examiner for an autopsy. Sullivan County’s project to pave the parking lot on the corner of Sunapee & Main Streets will start at midnight on July 7th. The parking lot will be closed for six weeks the expected duration of the construction period and an anticipated opening of Monday, August 21st. When finished there will be 45 paved parking spaces, including two for handicapped access. In addition, the parking lot will have improved drainage, new lighting, and landscaping. The project is a collaborative effort between Sullivan County and the Town of Newport. The Economic Development Corporation of Newport (ECON) is contributing $25,000 and the Town of Newport is purchasing the parking lot lighting for $32,000. United Construction of Newport was awarded the over $157,000 contract in May. Contact the Sullivan County Commissioners’ Office at 603-863-2560 with questions. It has been a long time in the making but on Thursday Governor Chris Sununu will sign SB-8 into law in Croydon. Senate Bill 8 clarifies town tuition by specifying that all towns in NH can include non-religious private schools in their school choice program. The public is invited to historic signing to be at 2:00 pm at the Croydon Village School. Refreshments will be served.